1901-08-25, Day, Cass County, Michigan, by William D. Baird, Sr.
Frances Ann Stewart Hood descended from a family who can trace its ancestry to the 17th century, to known members of the Sapponi and Pamunkey tribes of Virginia and to the once enslaved Africans who were welcomed into those tribes. Although not yet documented, some members of the Stewart family today believe that Frances also had Irish heritage through her mother, Barbara Creacy Stewart. Frances seems to have been aware of her heritage and proud of her family connections: She was herself named for her grandmother, and she gave her father’s name Richard to her first son, her mother’s name Barbara to her first daughter, and the name of a brother, Littleberry, to another of her sons, George Little Berry. Official documents indicating race reflect Frances’s complex genealogy. Most records categorize Frances and her husband Josiah Hood (born in Spain, for another complicating factor) as mulatto. Frances’s death certificate labels her as Indian. Records of her adult children in the mid-20th century generally identify them as black, and some collateral descendants identify as white. Frances’s father, Richard Stewart, migrated with his parents from Powhatan County, Virginia to White County, Tennessee in the early years of the 19th century. By 1830 Richard Stewart moved to Gallia County, Ohio, on the extreme southern state line, where the family is enumerated as “free colored persons” on that year’s census. Frances was born at Greenfield, Gallia County, Ohio in January 1832, the eighth of ten known children. Nothing is known of Frances’s childhood or youth, but two clues point to possible experiences: Frances could read and write, and she may have been working out of the home as an 18-year-old because she is not enumerated with her family in the 1850 census. Some of Frances’s brothers were among the pioneering African American farmers who settled in Cass County, Michigan, forming communities with good integrated public schools and the right of free African Americans to vote in school board elections, and with Michigan’s first African American Baptist church. In 1858, Frances’s father, Richard, decided to move the entire family to Cass County. He went about the move in a methodical way, reminiscent of the migration of the Latter-day Saints across the Plains to Utah in the same era. Richard went ahead of his family on horseback, keeping a careful record of the distance he traveled each day, as well as noting potential camping grounds. He prepared a homesite in Cass County, then he returned to Ohio for his extended family. The group, 21 in all, traveled with three wagons and a carriage, with loose stock herded along the way. Frances, age 26, drove her father’s carriage in which her mother and sister rode, followed by the wagon driven by her father, then the other two wagons driven by other family members. I don’t remember how many days we were on the road but we had, I think, three Sundays, but not three weeks. We drove from early morning until about 10:00 A.M. on the last day when we got to Bristol, Indiana. Stopped for a spell and the women went to the store a bought quite a lot of dishes. We then got to Calvin Center just before sunset. Got to Grandfather’s about 8:00 P.M. It was dark in Penn Township, Cass County, Michigan, about two miles north of Brownsville. This was the end of the drive. Real and personal property values recorded on the U.S. census of Cass County, Michigan, through the last half of the 19th century suggest how prosperous the Stewart family was: Richard’s real estate was valued at 5-10 times the values of many of his neighbors’. In 1860, Richard owned real estate worth $5,000, while a neighbor, Josiah Hood, held a farm valued at only $600. Josiah Hood, apparently widowed, categorized as mulatto in 1860, born in Spain or, as his death certificate records, “on the high seas,” in 1829, was the son of Samuel and an unrecorded mother. Frances Ann Stewart married Josiah Hood on 11 October 1860, before a Cass County Justice of the Peace. So Frances the farmer’s daughter became Frances the farmer’s wife, raising three step children and giving birth to six more, living in near proximity to Frances’s extended family. Little beyond the bare genealogical facts has as yet been discovered concerning the family’s lives until Josiah Hood died of a stroke at Calvin, Cass County, Michigan on 19 July 1899. In 1900, the widowed Frances Ann Stewart Hood, age 68, was living alone on her farm in Cass County, Michigan. Her children were married and scattered, in places as near as Indiana and as far as California. Extended family members still lived near her, within the same county. Son George Little Berry Hood with his family lived 30 miles away, in South Bend, Indiana, and remained in close contact with his mother. August 24th  Elders Wm. D. Baird , O.T. Stewart and J.A. Ols[e]n took train for Cassopolis, Michigan; from there Mr. George Hood and wife [Edna Epperson Hood] conveyed us by team to Calvin township. Sunday, 25th. Mr. Hood took us to see some of the neighboring people, and in meeting one of his childhood friends. he, in a convincing manner, made known unto him the testimony of the Gospel that God gave to him. ... At 11 a.m., over 300 people, with about 100 vehicles, met at a selected spot on the bank of the Christiana Creek, and listened with interest to an open-air service, which consisted of singing, “O, My Father,” prayer, and a discussion on the first principles of the Gospel by Elder J.A. Ols[e]n, etc. In solemn silence from the audience stepped forward Mr. George Hood, wife and mother, and were immersed in the pure stream by Elder J.A. Ols[e]n.
Frances was confirmed on the same day, possibly at the water’s edge. I was baptized August 25, 1901, by Elder James Oleson , and I know that a man must be called as was Aaron to preach the gospel, and that apostles and prophets must remain in the church until we all come to the unity of the faith. John the Revelator saw an angel earthward bound bearing the gospel, which I believe is here on the earth. Frances Ann Stewart Hood was a member of the branch at South Bend when she died on 21 March 1910. Although no record of her burial has as yet been located, it is likely that she was buried at Lakeview Cemetery in Calvin, Cass County, Michigan, where other family members lie. Baird, William D., Sr ., James A. Olsen , and Oscar T. Stewart , Letter to Editor of the Deseret Evening News, 27 August 1901; published as “The Work in Indiana,” Deseret Evening News, 7 September 1901, 22. Church of Jesus Christ of Latter-day Saints. Northern States Mission. Michigan Conference. General minutes, LR 17657 11. Church History Library, Salt Lake City, Utah. Church of Jesus Christ of Latter-day Saints, Record of Members Collection. CR 375 8, box 3111, folder 1, image 14; box 4165, folder 1, image 15; and box 4166, folder 1, image 53. Church History Library, Salt Lake City, Utah. Hamilton, Wanda Darlene Cage. Oil portrait of Richard Stewart. 2007. Indiana. State Board of Health. Death Certificates, 1899-2011. Certificate No. 1910-73, Frances A. Hood. Michigan. Division of Vital Statistics. Cass County Death Certificates, Certificate 1899-779, Josiah Hood. Michigan. Marriage Records, 1822-1940. Cass County, 1859-1889, p. 96. Stewart, Esther, [Biography of Richard Stewart]. Find A Grave memorial for Richard Stewart (1800-1875). 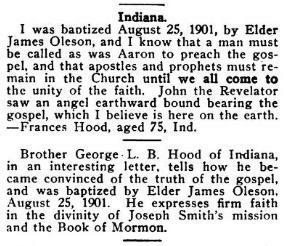 “Testimonies: Indiana.” Liahona, the Elders’ Journal, 8 August 1908, 191. United States. 1880 Census. Michigan, Cass County, Calvin. United States. 1900 Census. Michigan, Cass County, Calvin. Cox, Anna-Lisa, The Bone and Sinew of the Land: America’s Forgotten Black Pioneers & the Struggle for Equality . New York: PublicAffairs, 2018. Kianga. “‘ Sapponi Indian Cabins’ in 1737 and Contemporary Tribal Communities ,” Native American Roots, 11 August 2015. Mathews, Alfred, History of Cass County, Michigan. Chicago: Waterman, Watkins & Co., 1882. This ancestry is outlined on Family Search and on numerous Ancestry.com trees; no particular file is cited because it is impossible to know which tree is the original relied upon by the others. For documentation of the earliest known Stewart ancestors, see Kianga. “‘ Sapponi Indian Cabins’ in 1737 and Contemporary Tribal Communities ,” Native American Roots, 11 August 2015. Personal correspondence between Ardis E. Parshall and members of the extended Stewart family located through their contributions to Ancestry and Family Search databases. Church of Jesus Christ of Latter-day Saints, Record of Members Collection. CR 375 8, box 3111, folder 1, image 14, Church History Library, Salt Lake City, Utah. Anna-Lisa Cox, The Bone and Sinew of the Land; America’s Forgotten Black Pioneers & the Struggle for Equality (New York: PublicAffairs, 2018), 190-191. Paragraphs from that letter written by John Hall (son of Sarah Ann Stewart Hall), who as a child was a member of that 1858 traveling company, dated 10 October 1939, is embedded in Esther Stewart, [Biography of Richard Stewart]. Find A Grave memorial for Richard Stewart (1800-1875). Michigan. Marriage Records, 1822-1940. Cass County, 1859-1889, p. 96. Most online sources date the wedding as 1861, taking the year from the date of recording. However, all four certificates on that page were recorded on the same 1861 date, while the body of each certificate clearly indicates a marriage date at various times during 1860. Some online sources add two more children to the family, born in the 1870s, but those additions are incorrect: Neither supposed child is enumerated with the family in 1880, and in 1900 Frances informed the enumerator that she was the mother of 6 children, 5 of whom were then living. Her stepchildren, daughters of Josiah Hood and an unknown wife, were Indiana (1851-1917), Eliza A. (1852- ) and Jane (1855- ). "The Work in Indiana," Deseret Evening News, 7 September 1901, 22. We thank Esther P. Stewart, family historian who is familiar with Cass County, for correcting the name of the creek as it appears in the Deseret News clipping. Ms. Stewart has read this biography and offered other helpful assistance. Church of Jesus Christ of Latter-day Saints, Northern States Mission. Michigan Conference. General minutes, LR 17657 11, p. 107, 448. Church History Library, Salt Lake City, Utah.